I've wanted to play Neuroshima Hex since it was new, but it was a Z-Man game, and Zev has sent me, in the entire time I've been reviewing, exactly one game - and it wasn't Neuroshima Hex. So when I sold a bunch of games to Noble Knight and wound up with a hefty store credit, I used it to get the elusive Hex game and the first expansion. But even after playing several games of the original, I still had not played with Babel 13 until Thanksgiving, when I invited a friend to join my family for the holiday, and then spent the entire time playing games with him and ignoring my family (which, I should probably admit, works out great for me). My biggest problem with Neuroshima Hex is that you have this cool setting with punk-apocalypse characters and scary powers, and the whole thing is reduced to a faceless abstract (the faceless part, actually, is fine with me. Can you imagine how disconcerting it would be to play a game that actually had eyes and nose and stuff? That would freak me out). Every battle takes place in the same symmetrical junkyard, with the same bizarre warriors who can be summed up with a couple triangles and an initiative number. And now that I've played Babel 13, that complaint is forgotten. The new stuff in this box adds what the base game is missing - namely, a feeling of being there. Of course, since 'there' is a world dominated by monster robots and man-eating shrubbery, you may not want to feel it too much. But don't worry, you're still sitting comfortably in your living room, placing cardboard hexes on a cardboard map while ignoring your family and pretending that this is actually quality time. You don't have to survive sniper fire from mohawk-sporting road raiders. You just have to remember to take out the trash. That's not flowery prose - you literally need to take out the trash, or flies will start to breed on your discarded food wrappers and soggy coffee grounds. Of course, the most important thing about Babel 13 is that it comes with two new factions. The New York faction is a team of reinforced warriors who can take cover in the shadow of their headquarters, while the Neojungle is composed of walking rutabagas that build a massive plant wall and attack with a terrifying hive mind. The two new factions just feel more unique and post-nukey, with special pieces and cool effects that help you imagine a running battle in the wasted ruins of America (and yes, I just made up the term post-nukey, and will be applying for a trademark shortly). Only slightly less vital to the success of Babel 13 is the inclusion of terrain pieces. Now you don't have to fight over the same redundant slab of open landfill. Now you can fight through jungles and over hills. You can hide in reinforced bunkers and break into warehouses of supplies. There are more terrain pieces than you probably could have invented on your own, and they all do different things. Plus every piece of terrain could have different effects - the forest might be so dense that really big bruisers can't fit between the trees, or it could be so tall that it blocks attacks. A hill might provide cover, or it might add the ability to shoot over enemy troops and hit the scary guys behind them. With all the terrain in the box, you can create a huge variety of cool places to get killed. The last thing that really makes Babel 13 a must-have expansion for Neuroshima Hex is the list of scenarios. There's an entire campaign in the box, one that will let you play a half-dozen games in a row, with each battle having consequences that affect the next. The angry trees might team up with the psychotic robots or make friends with the mutant zombies. The humans could discover a huge weapons cache that will give them a definite edge in the next fight, if they remember to use them and don't leave them gathering dust because they forgot they were there, having been distracted by the promise of pumpkin pie with an absurd dollop of whipped cream on top (which happened to me, because I really like pumpkin pie, and it was, after all, Thanksgiving). 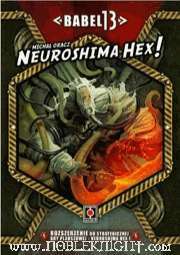 Now that I've played Babel 13, I really want to go get the other expansion for Neuroshima Hex. If it's anywhere as cool as Babel 13, it's going to be a great purchase. Not only are the strategic and tactical elements vastly improved by adding Babel 13 to the original, but I finally have a sense of playing out a battle, rather than arranging geometric chits to create a waterfall of unpleasant consequences, including (but not limited to) bludgeoning, explosions, electrocution, and being called very insulting names by elementary-school students. Not that any of those things are bad. But it’s nice to know they’re happening somewhere outside the dump. Babel 13 is a great expansion to a great game. You should totally go buy it... but it's out of print! Oh, woe is you! Where will you find this gem? Wait, I know. Noble Knight Games!